January 1, 2018, 12:18 PM · Instead of (yet another) New Year’s Resolution to eat less, exercise more, practice scales, or master second position (not gonna happen), I’ve made a commitment to play more chamber music. I recently had an experience that made me realize there’s a whole new world awaiting me, right inside my own home. Some friends came over for an informal holiday meal. One of our guests happened to be a superb violinist by the name of Miroslav Hristov. He brought his violin and a book of Heifetz/Kreisler arrangements. My husband, previously unaware of this, agreed to sightread the accompaniments at the piano. I wondered how violin selections would go over with our guests. It was an eclectic group, spanning four decades in terms of age and as many professions as there were people in the room: lawyer, preacher, psychologist, hotelier, school music administrator, librarian, etc. Most of these folks know that our parties end up around the piano with opera singer friends who can’t resist the opportunity to let off some vocal steam. But on this particular evening there were no singers in sight. Throwing an instrumentalist at this crowd was going to be a first. It got me thinking. If people enjoyed this experience so much, why not put some effort into making it a more regular event? And while I love my regular string quartet rehearsals, rather than being confined to repertoire dictated by the makeup of a specific ensemble, how about a solo flute, unaccompanied violin, or even a string octet? Or what about having instrumentalists play another part, for example, give the violin line to the oboe? Sessions could be theme-based, with music, food, and wine drawn from the same geographic area. Alternatively, music could focus on the birth or death anniversary of a composer. Sessions could even revolve around a given musical form, such as the fugue, chaconne, or gigue. Pros versus amateurs? There are many wonderfully talented amateurs who may not be comfortable performing in a professional arena, but bring a great deal to an informal setting such as this. And many are looking for opportunities to collaborate. I believe that when it comes to chamber music, enthusiasm is the most fundamental component. Include non-performing guests? I guess we’ll call them “audience members,” for lack of a better term. If we’re planning to sight read, then keeping the guest list to performers only may be a good idea. Food and drink? Yes and yes!!! As we now begin 2018, here’s to more chamber music! January 2, 2018 at 05:02 AM · What a pleasure to hear about sharing live music in an intimate home setting. Well into the 20th century live music in the salon after dinner was de rigueur in Europe. Play on! January 2, 2018 at 12:30 PM · Best New Year's resolution I have heard! According to the New York Times, the most effective motivation for keeping resolutions is the promotion of "strong social bonds — relationships that would encourage people to cooperate and lend support to one another." That's chamber music in a nutshell! Best wishes for a happy and musical 2018! January 2, 2018 at 12:35 PM · Very important and informational read. Found this educating and enjoyable. Happy playing! January 2, 2018 at 02:44 PM · Wonderful article with some great ideas! I'm always looking for ways to inspire me to practice more, and these chamber music get togethers would be terrific motivation . And what fun! Thanks, Diana. I will join you with this New Year's resolution. January 2, 2018 at 03:36 PM · Great idea, Diana. Bring back the musical salon. January 2, 2018 at 04:19 PM · Loved this! The power of music never fails to amaze me! My mother was a marvelous classical pianist and they had a group of friends that they called the Cousins’ Club - nobody related but just friends. A group of about 5 or 6 couples who got together at each others house and made music, sang and ate on many weekends - my mother played the piano, there was a violinist, some sang, etc. I have very fond memories of those evenings. January 2, 2018 at 11:14 PM · I am so appreciative of these wonderful comments! Thanks for taking the time to read my article and respond. I'm happy to know there are many of us who look forward to more chamber music in 2018! January 4, 2018 at 03:16 PM · Hi, 76.107! Glad to hear about "concert time," and particularly happy to know that it continues to thrive! January 4, 2018 at 07:07 PM · Loved the article! This salon gathering is something my husband Michael and I talk about all the time. Also, to include other types of music,as well as literature, art, etc.. It is a great way to socialize and spend real time with our friends while introducing something new to others who may have an interest but not a real opportunity to do so in an intimate setting; and of course with good food and drinks. 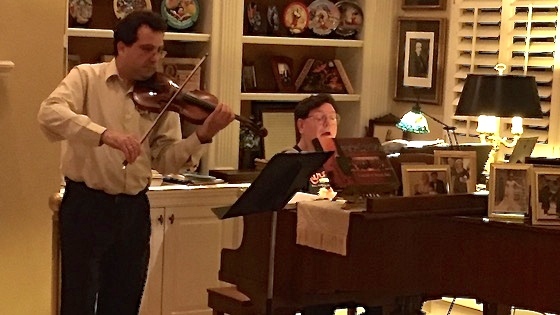 At our home we love to end up our social gatherings with guitar and piano music; and always encourage others to bring their instrument along with them, or singing. I hope your article will inspire people to engage in a more interesting social way other than television or social media which is so impersonal. Thank you Diana! January 4, 2018 at 09:46 PM · Thanks, 73.108! I love your idea of adding in literature and art! It's so heartening to hear of your wonderful experiences!